Keeping goldfish is relaxing, soothing and aesthetically pleasing. Keeping an aquarium in the home with a few fish swimming about and with the soft bubbling sounds of the aerator is truly a therapeutic experience. Goldfish do not generally require much maintenance once the aquarium is up and running smoothly, but they do need clean, oxygen rich water in order to remain comfortable and healthy. For this reason, it's clear that good quality water is crucial in order to create a healthy ecosystem in the aquarium and be successful in keeping freshwater fish. Estimate the water capacity of your aquarium so that you know how much bottled water to buy. To do this you may need to check the owner's manual that came with the aquarium, or you can fill up the empty aquarium with tap water using a gallon container, counting how many gallons it takes. This way you will know how many gallons it holds. Be sure to empty all the tap water. Once you know the capacity, you are ready to fill the aquarium to within two or three inches from the top with bottled water. Purchase bottled drinking water from a grocery store. Make sure the water is not distilled, demineralized, flavored or ionized. It should be bottled at the source, uncarbonated, natural spring water. Reverse osmosis water may not be safe for fish because it is filtered, and some of the mineral content will have been taken out in the process. Natural water contains minerals fish need. Look for wholesale, bottled water suppliers. Buying the water wholesale will save you money in the long run. Look in your phone book or you may be able to order cases online and have it shipped to you. Find out shipping costs as this can be expensive. Alternatively, you can buy cases from your grocery store. Put in a special order for bottled water if they don't have enough in stock. If you are just replacing some of your existing aquarium water, make sure you only change up to 25 percent of the existing water with the bottled water. Remove the water from the tank with a clean, soap and detergent free dish, and top off the aquarium with the bottled water. 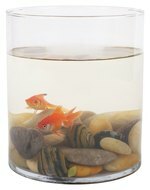 If you are changing all the water, try to leave the water in the aquarium overnight before placing the fish in the tank. The temperature of the aquarium water should be the same or close to that of the water the fish are currently in to avoid shocking them. Top off the aquarium water by up to 25 percent once every two weeks with the bottled water. Try to use the same brand if possible to ensure the same level of mineral content in the water. This is preferred but not necessary.